Spacers are small blue or green elastics that are placed between the teeth to gently push them apart creating room for a metal band or ring around the tooth. The teeth may become tender, similar to the feeling when a piece of food is caught between the teeth. Over the counter pain medication may be all that is needed to relieve the discomfort. Softer foods may be easier to eat with tender teeth. No sticky foods. Normal brushing is encouraged but the teeth should not be flossed where the elastics are. 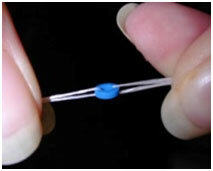 Take two pieces of dental floss and loop them around each side of the spacer, as shown in the picture. 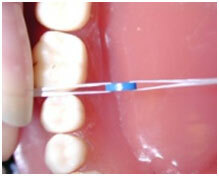 Once the floss is wrapped around the spacer, use two hands to floss the spacer in between the teeth. It may be easier if you stretch the spacer while flossing it into the teeth. If you cannot get your spacer back in please call our office to schedule an appointment.